Remember yesterday when I mentioned a photo shoot for a new pattern? Well, I can show you the results now! The Elsinore shawl is now available to buy from Ravelry which is why I can now show you some of the amazing photos we shot in Copenhagen. I had long wanted to shoot some photos in Denmark as I gather so much of my inspiration from my old homeland. Elsinore proved the perfect pattern: I designed it with a persistent idea of 'flatness' in mind: the stitch patterns are quite pared down in order to showcase the fabulous colour of the yarn. Flat and pared down .. all are words that I could use to describe Nordic light, especially during the winter months. 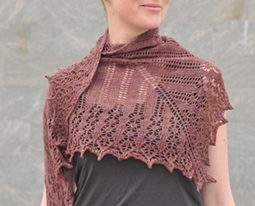 That is not to say that I think Elsinore is a minimal shawl. I started out wanted to capture 'flatness' but the simple lines turned out to be really flattering once draped over a person. I was really lucky that my old friend Kirsten Marie agreed to model for me. She sings, she knits, she reads, she translates, she sews - and now she models too. And Kirsten Marie introduced me to a photographer who was interested in the challenge of shooting lace shawls in the depth of winter. Win-win. The original sample is knitted in OMA superwash merino 4ply in "strange rock'n'rollers". It took roughly 390 yards to knit the sample but I recommend 400 yards in the pattern just to be on the safe side. And as always I recommend using a 4mm (US 6) needle to give the shawl a good deal of drape. The yarn was phenomenal to work with and the colourway was very interesting: it kept changing colour dependent upon where and when I was working on it. And the last chapter in this story belongs to my poor test knitter, S. She kindly offered to testknit the pattern whilst I was gallivanting in Denmark. Unfortunately this meant she actually testknitted most of my next pattern. Amazingly the wrong chart worked really well with the Elsinore charts and she did not suspect a thing. I felt horribly guilty when I realised what had happened - but it's intriguing that the chart worked! Elsinore was such a joy to design and knit. It came together very quickly and proved a really relaxing knit for me. I hope you'll enjoy it too.